We are pleased to offer Online previewing and ordering through our partnership with ShootProof. As a special incentive we offer 10% OFF our price menu for additional prints when ordered through Shootproof. Call us to request a link to your gallery or use your client portal to log in to your gallery. Why choose a DaVinci booth? How many times have you been to a garage sale? Even if you're not a frequent garage sale shopper, I'm sure you've come across a wedding favor or two! Fact is, how many of us actually use crystal miniature ice buckets? Or don't already have a set of measuring spoons and frankly, who really has wallet size photos to put into those miniature frames? And here's a good one... I ran into a couple at Michael's buying photo ornaments that they were going to put THEIR own picture into and give as favors. Really? What exactly is the purpose of a Wedding Favor? It is a gift given to your guests to show your gratitude for attending your Wedding! The operant phrase here is "to your GUESTS". Surely, your parents and grandparents would love to display a photo of you on their mantel and even their Christmas Tree - but seriously, how many Wedding photos of OTHER people do you have around YOUR house? Likely, none. The favor should be something meant for your guests; something that they can use; something that they would cherish, and yet, something that will surely remind them of your exquisite Wedding and their gracious hosts. a PHOTO BOOTH, not only is this the most perfect favor, memorable, unique and useful, it is another form of entertainment at your Reception! Who wouldn't LOVE to have a fun pictures taken of themselves to take home as a favor? You can include frames or give them in folios. There are so many options.... You can include props to go with your theme - like glamour hats, cigars, top hats and pearls or if you're doing a beach theme, why not ask the company to put a sand box out and a beach themed backdrop? Guests who may not love to kick it up on the dance floor or drink, will have so much fun getting pictures taken in the privacy of the photo booth! Another great concept that comes along with the photo booth is that it serves a double function, as a photo sign-in book. Once your guests take their pictures, two copies of their picture strip is produced. One is given to the guests and the other is placed in the book for the guests to sign. This way, you and they will get all the photos and their well wishes, as well! You won't find that at a garage sale! Word of advice, thought, before you book your photo booth, make sure it's not one of those very small ones that you generally see at movie theatres because they are very difficult to fit more people into, especially the bride in her dress. Get the photo booth with curtains that can fit in excess of 10 people, so groups, big and small can have a ball and so will you looking at the pictures later! 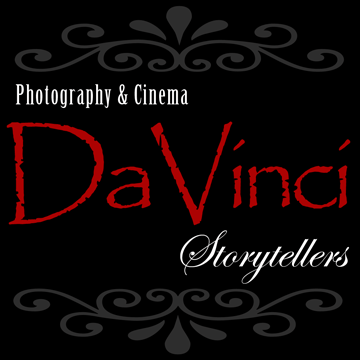 No one has the design, style and quality of prints that DaVinci can produce for you. Your friends, your family, your entire Bridal Party can fit inside to capture the greatest pictures ever, while still giving you that classic photo booth feel. With our 22" High Definition touch screen you can view yourself in vivid color and take control to pick your choice of photos... color or B&W and turn on the HD video option. High Defintion quality 4 pose photo strips will be available in 50 to 60 seconds and will last forever on our water proof paper. Guests can keep one strip and we will add the other to your custom personalized Photo Scrap Book. Talk about fabulous? I have been to hundreds of weddings of all types of budgets and all types of venues and if there is one thing that you can practically guarantee to make your Wedding Day not just the talk of the town afterwards, but a fun and fabulous event, it is to show a Love Story! The outpouring of emotion transforms everyone who views it and creates so much excitement, you'll have a party of the century! But besides that, what a beautiful token of your relationship to have with you forever, to be able to show your children, your grandchildren and just enjoy it for yourselves once in a while! With today's busy schedules, many of your guests probably didn't make it to the Church or Temple to see your Ceremony. They certainly weren't there when you and your fiancé got ready and didn't get to witness the look in your dad's eyes as he first saw you in your Wedding gown. So why not allow them to share all those Special Moments? Your videographer can capture everything from you getting ready to the Ceremony, your fun photo session with your attendants and through your first dance and still have time to put it together in a captivating short film that can be shown right there at your reception! All you will hear is "WOW! I can't believe it" and "OMG, This is incredible!" A front row seat at the most amazing production starring YOU and YOUR FAMILY! Imagine the look on your friends and families faces when they see the beautiful story telling images of your wedding day that were captured just moments ago. Shown at your reception on a High-Definition 24 inch widescreen display this showcase is the perfect example of "Living in the Now!" Unique in design and distinct in style the Premium Digital album is a refreshing new trendsetter to the wedding photography industry. This book will display a classic, timeless photographic documentary of your special day. Our creative album designers will layout your album with all the flair of a “New York Style” publication, Just tell us your selections and we’ll do the rest. We can sit with you and help you custom design the perfect wedding pictorial, We’ll present and help you choose the perfect color and style albums that will compliment your home and decor, our design specialist will process your order and notify you when your order is complete. We will combine our unique images with your music selection to create a beautifully mastered DVD montage of your special day. This montage includes up to 100 images, transitional effects and is encased in a leather folio case with 2 images. We will photograph timeless portraits in an enviromental setting of your choice. Whether it's the Beach, Park or Urban setting we will capture the very essence of your chemistry together to be cherished for years to come. will display a classic, timeless photographic documentary of your special day. As your ONLY service provider who will be with you your entire day starting from Preparations till the end of your Reception, We have worked with them all! Limousines, Florists, Disc jockeys, Officiants, Bands, etc. check the best out here! Receive emails with online specials, promotions and newsletters!